April 1, 1999 was a big day for the Danbury, CT based helicopter company, Associated Aircraft Group (AAG). It marks the day the massive helicopter manufacturer, Sikorsky Aircraft Corporation acquired AAG. Since then, AAG has surmounted expectations and grown to be the largest Northeast operator of Sikorsky S-76 aircraft. With a record number of safe flying hours, exceeding 60,000 hours, unparalleled aircraft maintenance, superior aircraft management, and a workforce that has grown to just over 70 employees, AAG continues to be an industry leader in the world of business aviation. 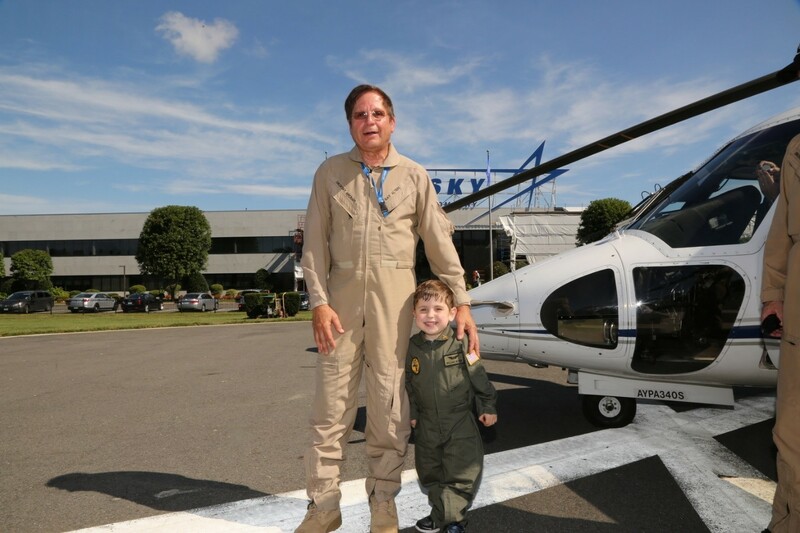 COO, Ray Altieri shown here with William Beyer on the Make-A-Wish Day, Sikorsky held for him on September 4, 2018. William was able to copilot the S-76 with Ray, making it a day to remember. 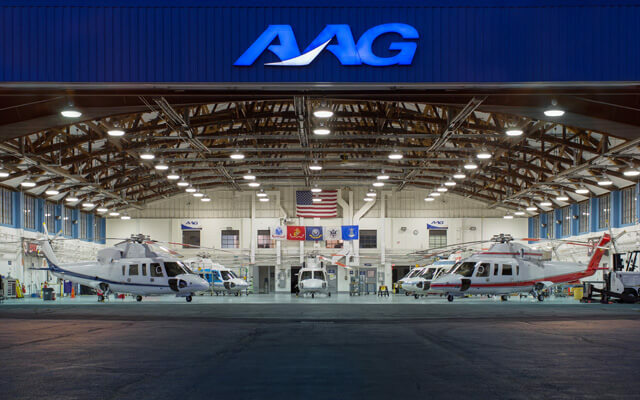 “Sikorsky wanted a company that could provide charter and fractional services and support them in the flight operations business, we have done just that for the past 20 years,” says AAG Chief Operating Officer and Designated Sikorsky Pilot Examiner, Ray Altieri. AAG will celebrate 30 years as a company this November, and was founded by Altieri and two others on November 1, 1989. Currently based out of Wappingers Falls, NY at the Hudson Valley Regional Airport, AAG has maintained helicopter excellence in the industry, with additional bases in Teterboro and Trenton, NJ, Providence, RI and most recently Bridgeport, CT. With more than 12 aircraft, AAG is the poster child for luxury helicopters getting VVIPs, CEOs, celebrities and the like, to and from their destinations throughout the northeast. AAG does more than just transport executives to and from business meetings, they are well respected throughout the Dutchess County, NY community. Donating flights to various charity organizations and assisting the local Sheriff’s department frequently, particularly when a tornado struck in 2018, AAG provided S-76 support to survey the damage. 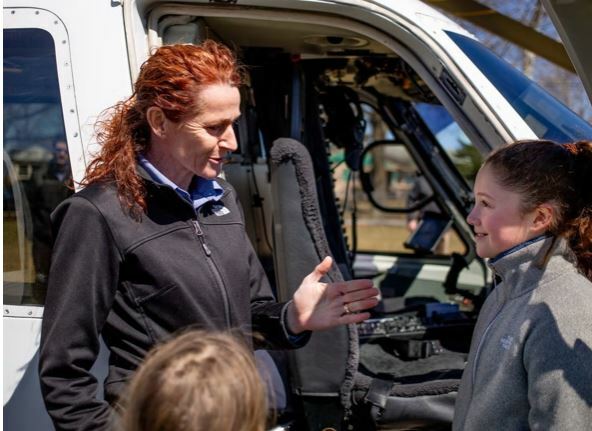 Kim Barwick, AAG Pilot is shown here speaking with students at the annual GETT (Girls Exploring Tomorrow’s Technology) STEM Expo at Phoenixville Area Middle School, sponsored by Sikorsky. AAG provided the S-76 for a demo at the event and girls were able to sit inside the aircraft and talk with pilots. Partnering with PALS (Patient Airlift Services) has been a priority for AAG for many years. Donating flights when possible, to transport patients in need to and from their homes to hospitals, is something AAG is proud to support and continues to do so. Most recently, AAG provided the S-76 demonstration at the GETT (Girls Exploring Tomorrow’s Technology) sponsored by Sikorsky Coatesville. AAG is proud to be a part of the Sikorsky family for these past 20 years and looks forward to many more years of success with the Sikorsky and Lockheed Martin family.